Univ of Massachusetts Pr, 2011. Douglas Light's short story collection, Girls in Trouble, was selected by Peter Ho Davies for the 2010 AWP Grace Paley Prize. It will be published by the University of Massachusetts Press in 2011. 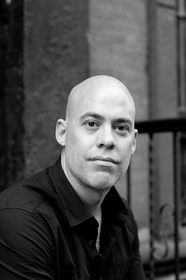 He is the author of East Fifth Bliss, which received the 2007 Benjamin Franklin Award for Fiction. The screen adaptation, which he co-wrote, completed filming in May. It stars Michael C. Hall, Lucy Liu, Peter Fonda, and Brie Larson. His second novel, Where Night Stops, will be published in the fall 2011. He received a 2010 NoMAA Grant for his novel Where Night Stops, was selected as a Finalist for the 2002 James Jones First Novel Fellowship and for the 2010 Indiana Emerging Author Award. His fiction has appeared in Narrative, Guernica, Alaska Quarterly Review, failbetter, and in the O. Henry Prize Stories and Best American Nonrequired Reading anthologies. ftw? ha ha. goudlas? wow, talk about tulti-masking! Thanks for the wall post, Goudlas. It's a great, great piece. Ha, I can totally see that recipe! Such a nice detail in such a fine piece of work. You are most welcome, Douglas. It was my pleasure to read it. You must log in to write on Douglas Light's wall.